Planet BB: The Boys’ Brigade Around the World – now available! 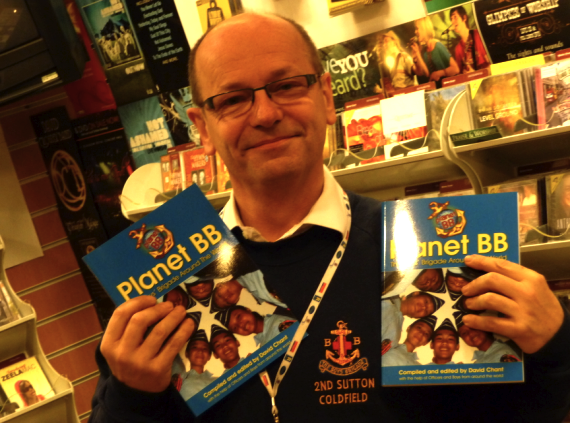 PLANET BB: The Boys’ Brigade Around the World was officially launched at Wesley Owen Books & Music, Birmingham, on Saturday 11 December. Already, pre-orders of around 700 copies have been despatched all over the world! This includes 100 copies to Malaysia, 50 to Australia, Indonesia, Hong Kong & Singapore, 150 to Wesley Owen, 50 to Koorong, and many more individual orders! The website (www.planet-bb.co.uk, designed free of charge for the project) is about to be updated, but in the meantime please send any enquiries to me – bbworldwidebook AT live.com – and I will let you know the best way to order. Depending on size of order, bookshops may get very favourable terms. All royalties are being sent to Global Fellowship, the BB international wing, to use where they feel appropriate. So far we have raised over £2000 through various non-book sales, all of which has gone to an orphanage in Uganda run by a BB officer. See the Facebook groups, PLANET BB: The Boys’ Brigade around the world and Let’s make this the biggest Boys’ Brigade group in the world. There is also a Facebook Page and to date, between the 3 there are about 5000 members worldwide! We now also have a Twitter account @planetbbbook. All the Facebook members have been talking excitedly about Planet BB for more than a year, and now they have finally got a chance to buy it! I have already received favourable comments from many BB folk who have received their copy. As you are aware, not every BB member will be on Facebook or Twitter, so many will not have heard of the book. It did get a write-up in the officers’ Gazette a year ago, but that will be long forgotten now. Can you please announce it to as many BB Companies as possible as this book deserves to be read by anyone involved with the Brigade? A poster is available from the publisher and I am sure if you do a bit of local promotion, sales will be good. Birmingham Battalion announced the launch it its bulletin, and it was great to see quite a few BB people who had not heard of the project before. 20 copies were sold at this one event. Planet BB has been written by boys, officers, Brigade secretaries, and Presidents from almost 30 countries. And don’t forget, the royalties will be going to help the BB in countries where there is desperate need for financial help. See below for more details of the book and the publisher’s information sheet. Thanks guys for the encouraging messages! Thanks guys for those encouraging messages. Have you sent a review copy to the Goodbookstall? « Christianity on the High Street: is there a better way?